Hardcover in fine condition. Dust jacket in very good condition, rough at the top edge and a red spot on the back cover. 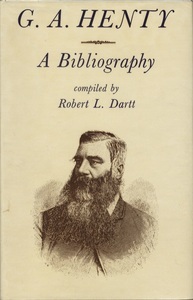 Bibliography of all of Henty's books organized by topics. Contains few pictures and photographies, and an index. New Jersey: Dar-Web, Inc./Altrincham: John Sherratt and Son Ltd.
Dartt, Robert L., G. A. Henty: A Bibliography, New Jersey: Dar-Web, Inc./Altrincham: John Sherratt and Son Ltd., 1971, Children's Literature Archive, accessed April 24, 2019, http://childrenslit.library.ryerson.ca/items/show/7128.